Some Sums Are Worth Practicing! Today we focused on the importance of a word sum, and how a word sum is to be read. I picked the base element <joy> to work with because I was confident that the students would be able to brainstorm a list of words that are morphological relatives of <joy>. A morphological relative shares the spelling of the base and the denotation (is from the same etymological root). As the students thought of words, I wrote them in a column to the right. When we had a good sized list, I asked if anyone could give me a word sum for one of the words. At this point, I emphasized that the base element was <joy> and could not be made smaller without losing its sense and meaning. I compared writing a word as a word sum to splitting a spelling into syllables. Syllables carry no meaning, but morphemes do. Syllables may or may not help you with pronunciation, but a word sum will always help you understand a word’s meaning. You will find words written as syllables in most dictionaries. There is no internet site or dictionary that lists word sums. Word sums have to be reasoned out by you! This last bit is extremely important. Students are used to finding answers in books or on the internet. They are used to answer keys with which to check their work. At first they feel confused by word sum hypotheses. That happens because they have not been exposed to enough word sums. With time, they begin to notice patterns and recognizable clues which in turn help them write a more likely initial word sum hypothesis. 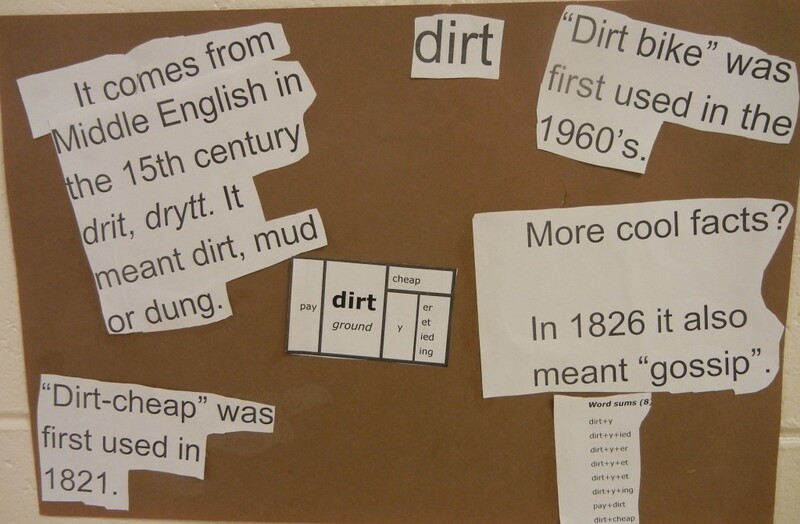 Through experience working with word sums, they better understand that all words have structure. They become less nervous in proposing a word sum hypothesis and instead are actually excited at the prospect. Some of my past 5th grade students have said that proposing word sum hypotheses was one of their favorite parts of orthography! As the students hypothesized each word as a word sum, I wrote the word sum along with the ‘is rewritten’ arrow to the left of each word. That way I had the full word sum represented for each word. Next I modeled how I wanted each word sum read. I’ll use the first word as an example: <j..o..y plus ful is rewritten as j..o..y (pause) ful> … joyful. The natural tendency was to pronounce the elements as if they were words. Changing that tendency was part of what today’s practice was all about. We don’t pronounce elements until until the word is complete. Since a word sum is a visual representation of the composing of a word, nothing is ready to be pronounced because the word is not completed. Everything is spelled out. I also encourage the students to announce the spelling of the suffixes a bit quicker than they do the spelling of the base elements. I want them to think of the suffixes that they will be seeing often as recognizable units. I want them to rattle off, for instance, suffixes such as <-ing>, <-ed>, <-ous>, <-ly>, and <-ic>. Then when they are in the midst of spelling a word on paper, the spelling of that suffix is in their head and there is less chance of leaving a letter off. A few other things came up as we looked over this list. We talked about the difference in spelling between <-ful> the suffix and <full> the free base word. I introduced the idea of announcing the suffix <-ness> as <n..e..double s>. It was also an introduction to looking at what each element in a word sum contributed to the overall sense and meaning of the completed word. I showed them a chart that would be at the board to remind them of the types of elements we might see in a word sum. I pointed out that bases and affixes are written morphemes. In the first few weeks of school, we have been talking about the difference between a base that is free and a base that is bound. The students will be investigating twin bases later in the year. Since the students (in groups of 2-3) have already begun investigating science words, we have also talked a bit about everything else on this poster. Each small group is investigating a word similar in structure to <biosphere>. Each word is compound with <sphere> as its second base. 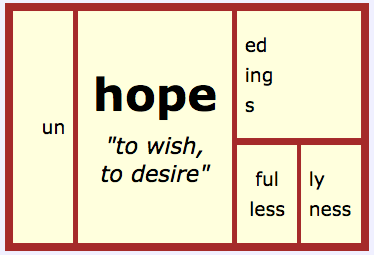 Each word also has a connecting vowel – in this case an <o> because one or both bases in their compound word are Hellenic (from Greek). I started at one end of the room, and asked each student to read a word sum and finish by pronouncing the completed word. When we came to the bottom of the list, we started over. In that way, every child was able to individually read a word sum. In listening to the readings, the process became familiar to all. This is a practice I will continue doing throughout the year when we collect any list of morphological relatives. Hearing themselves announce the word sum will help this idea of a word sum become part of what they understand about all words. 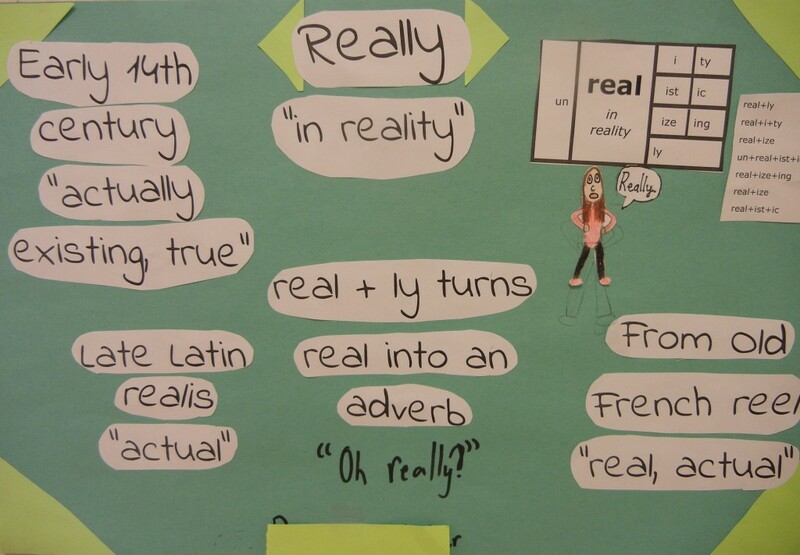 When they are writing and asking themselves how to spell <really>, I want them to remember that the base is <real> and they are adding the suffix <ly> to it to form the word <really>. A few students inadvertently said “equals” instead of “is rewritten as” when they saw the arrow. That was a great opportunity to compare a word sum to a math equation and to point out the use of “sum” in our use of “word sum”. 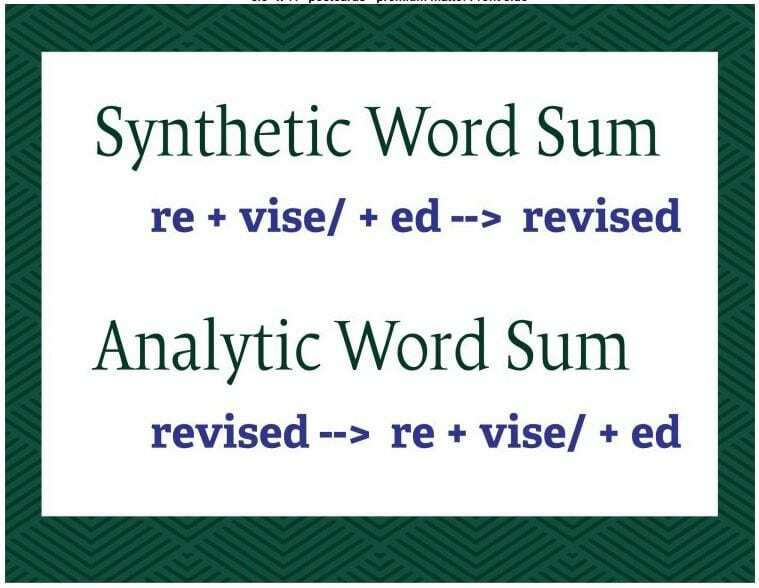 I also used this opportunity to talk about the difference between a synthetic word sum and an analytic word sum. I pointed to the poster card I now have on my board to remind them of these new terms and what they mean. (Check out the store tab on my blog if you are interested in a set of my cards. 🙂) I explained that the word <synthetic> means to put together and the word <analytic> means to loosen. So a synthetic word sum is the kind of word sum that begins with elements and combines them (puts them together) to form a complete word. An analytic word sum is the kind of word sum that begins with a completed word and loosens it into its elements. I told my students that my goal is for them to spell a word by its morphemes. 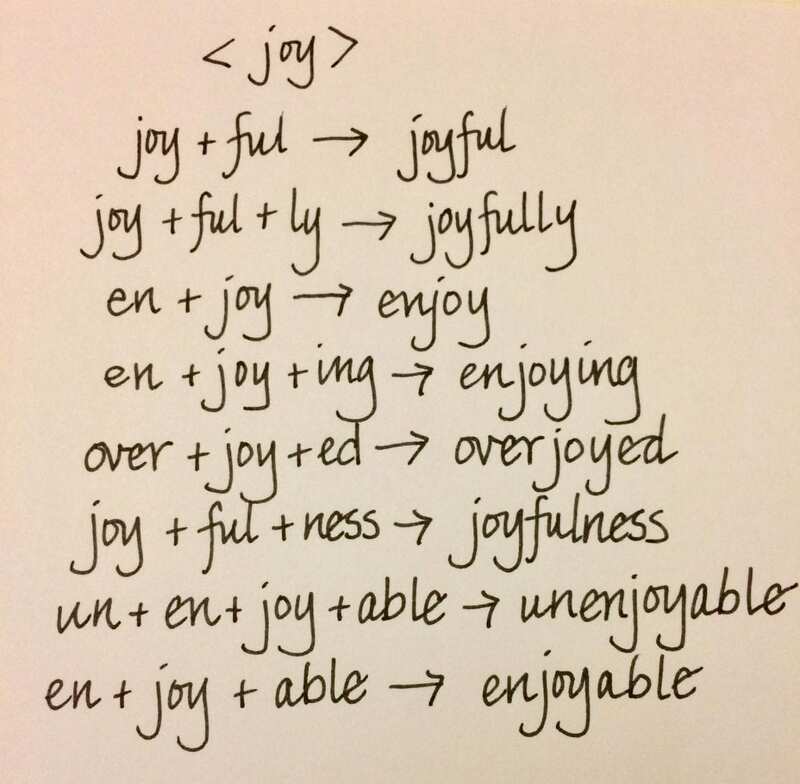 I want to replace the often torturous memorization of “letter letter letter” type sequences with knowing that a word has, for instance, a base <joy>, a suffix <ful>, and another suffix <ly>. This will not be accomplished by sounding out words, but rather by learning about structure and repeatedly seeing and using some common affixes and bases. The students enjoyed this activity and asked if we could do it again sometime. Yes. 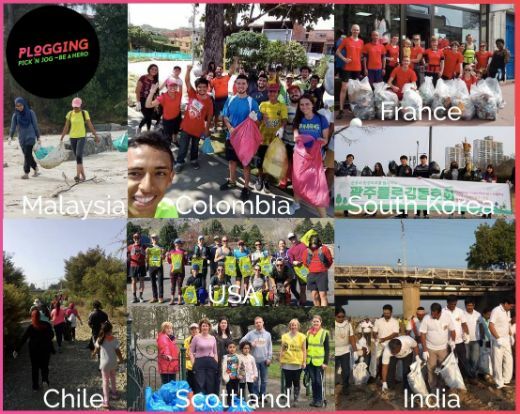 We can and will do it many many times! I promise! Why is it that in a traditional spelling program, students are not taught that a word’s spelling represents its meaning, or that all words have a structure? In most every program, they are taught only, and might I add falsely, that a word’s spelling correlates to its pronunciation. And because the reality of that doesn’t pan out, students learn to spell words as a rote activity. Students spend lots of time looking at words that share similar strings of letters. Ultimately, the expectation is that the student will have seen the word so many times that they will have memorized its spelling. In this model, the students know strings of letters. They do not understand whether those letters form an affix, a base, a combination of more than one of those, or have a sense and meaning on their own. See? The way we teach spelling is not about understanding. The expectation by the teacher and by the student (and by the administration for that matter) is that there is nothing to understand. English spelling is something you just have to memorize. What a shame. Math would never be taught like this. Who in their right mind would have students memorize one 2-digit by 3-digit multiplication problem at a time with a goal of twenty a week? No one. Instead, we teach the students how to multiply and then expect them to apply the skill to any numbers and situation out there. We expect students to understand the operations and ask questions. We want them to provide step by step explanations for solving problems. But not so with spelling. The people teaching it right now, are doing the very best job they can. I believe that. They are teaching what they understand to be the truth about English spelling. Ah. But there’s the rub. Their own understanding of our language is lacking. Hugely and completely lacking. At some point in our history (several generations back), it was decided that English was much too hard to learn, and so needed to be simplified. 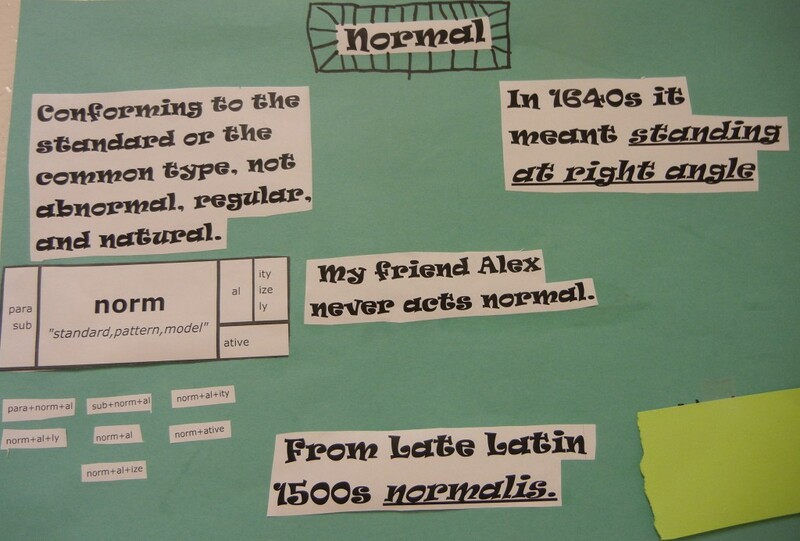 Latin would no longer be taught in schools. If you are fortunate enough to know someone who learned Latin in their early schooling, my guess is that they will tell you how very valuable it still is for them in deciphering what words mean. 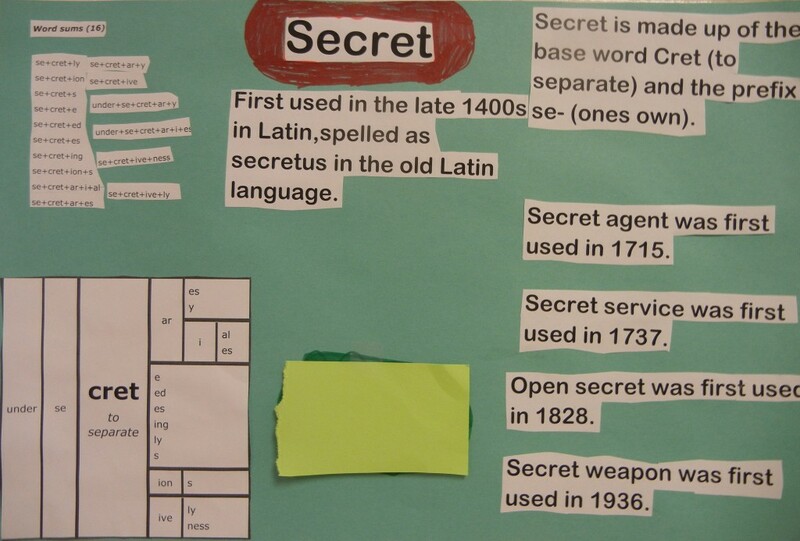 The very fact that at one point Latin was part of a school curriculum tells you that there was once an awareness that spelling represented a word’s meaning. 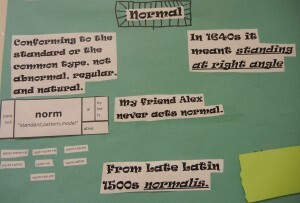 But when Latin left the curriculum, so did the idea that spelling and meaning were related. It was decided instead that very young children must learn letters and sounds outside of the context of a word, and then apply that knowledge of, say,”S is for snake – s-s-s-s-” when being told to sound out words. But <s> isn’t always representing /s/. Sometimes it represents /z/ as it does in dogs. Sometimes it represents /ʃ/ as it does in sugar. Sometimes it represent /ʒ/ as it does in usual. And <s> isn’t the only consonant like that. Yet we start by teaching young children that it only represents /s/. I’m not suggesting that children don’t need to know the alphabet. They do. Absolutely, they do. But what if we taught them to look at letters as we see them in words? What if we taught children about graphemes and phonemes as they live and breathe inside of words? What if we picked a word the student uses – better yet, what if we let the child pick the word they are interested in, and we looked at it together. The adult guides by speaking about spelling features, structure, and a word’s story in straight forward terms. The adult does not talk down to the child or invent silly rules or names for things. The adult explains and lets the child ask questions that will help them make sense of English spelling. One great way to introduce structure to a child is to have them look at a family of words that share a single base. Believe me, structure won’t be the only thing that gets talked about, but it is the big topic starting point. Teaching specific base elements will familiarize children with how we can add and remove affixes to build a family of words. It will also familiarize them with the fact that many of the words in our language are related to one another by their history and their meaning. It opens them up to exploring that not only are we merely forming additional words that share the base, but that some specific suffixes will build word relatives that are nouns whereas others might form adjectives. Students will learn the suffixing conventions in a more meaningful way – with a more intrinsic understanding than they do currently. As is, they come into fifth grade knowing how to spell a bunch of words, but not understanding the structure of any of them. They know that some have similar spellings toward the end of the word or at the beginning, but they have no understanding of why or if it means anything as far as how we use the words in our writing or reading. When children are starting out learning about a word’s structure, it’s important to help them recognize the affixes they see often in their reading. Even if their reading is not fluent yet, they can compare the words on a list and recognize that letters have been added to the base. They will most certainly recognize these words once read aloud and be able to talk about them. Let’s look at <water>. I found it on a first grade sight word list. Perhaps these could be written on cards (separate cards for each base and suffix) that the child can match up and spell out. As each base is matched with either another base and/or suffix, have a discussion with the child about how that word might be used. The words might also be written in color as I have done to point out bases and affixes. You might begin to introduce to the child the idea that when added to this word, some suffixes will indicate the word is an action. An example of this is ‘watered’. I watered my flowers today. See how watered is an action? But water by itself is a thing. I might drink a glass of water. Draw pictures next to the words to represent either a thing (noun) or an action (verb). 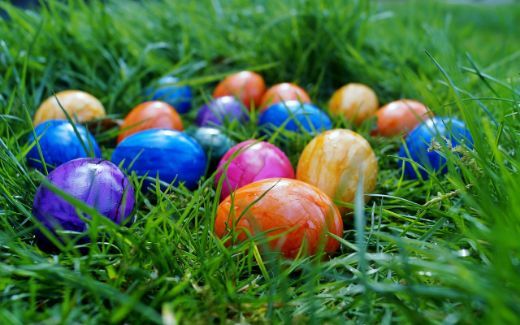 There are some truly great descriptions of activities to do with younger learners at Beyond the Word, Lyn Anderson’s blog, and also at Rebecca Loveless’ blog. I encourage you to check both of them out to read some step by step directives as well as to see how students react. Another thing to notice about these words in particular is that the parts of the words that are in green are bases. When two bases are joined, they form a compound word. How is rainwater different from bathwater or dishwater? Why are some paints called watercolors? What do you know about watermelon that makes you think of water? 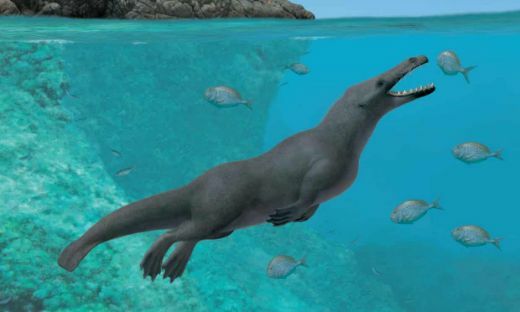 What is something that lives underwater? Before my own children knew how to read, they loved making books. They would tell me a story and I would write it down. Then we would fold paper and they would sew the pages together with a large dull needle. I would write a sentence or two of their story on each page, and they would add the pictures. Every day we would read one of their books together. Bookmaking could be a fun activity using a particular family of words such as water. 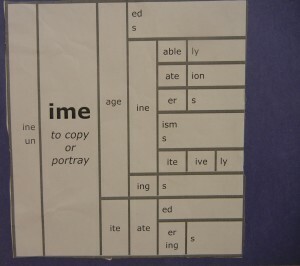 If I could design spelling tests, this is certainly how I would do it. After a week of discussing the meanings and uses of these related words, asking the students to spell them seems reasonable. If each week there were words related in this manner, over time students would recognize many prefixes, suffixes, and bases. They would begin to internalize that often words are related to one another; not because they rhyme, but because they have meaning and spelling in common. ~What does it mean when we make something? ~How do we construct ‘maker’? Is there an <-r> suffix or an <-er> suffix? ~What kind of a sense does the <-er> suffix add to the word <shoemaker>? ~How many of these words are compound words? ~Do you notice how the <c> in <peacemaker> has an /s/ pronunciation? Why is that? ~Why don’t we replace the final non-syllabic <e> when constructing the word <makeup>? ~What is the suffixing convention in which we replace the final non-syllabic <e>? ~Many teachers have learned that the final <e> is dropped. That is also what they teach their students. Why is ‘replaced’ a better word to use? ~Write these as word sums and announce each one. 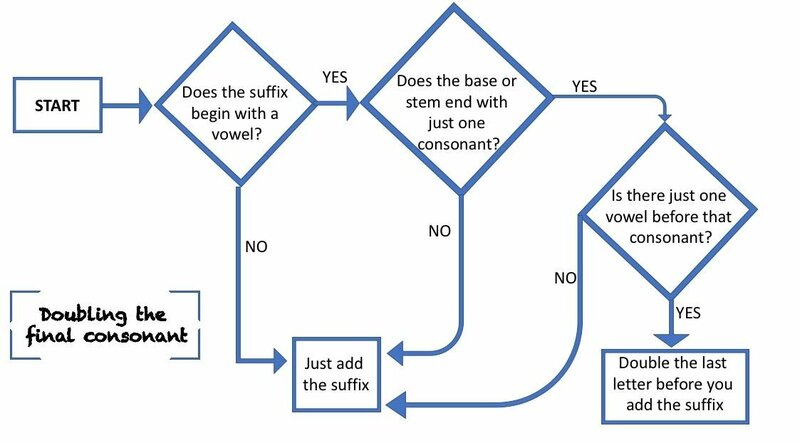 If you want to focus on the suffixing convention in which the final consonant of the base is sometimes doubled, perhaps you could use this list. Looking at the word by itself, use what you know about IPA to guide their pronunciation and match it to the graphemes representing it. Here is the IPA for <stop>: /stɑp/. Please take into consideration any dialects present where you and the children live. That might make a difference to the pronunciation. If we make a list of words with stop as a base, it might look like this. As you read it, can you spot some great things to focus on during a week of working with these words? ~What does it mean when something stops? ~Which words on this list are compound words? ~Use ‘stoppable’ and ‘unstoppable’ in sentences. What is the difference in meaning? Which morpheme in those words is responsible for that difference in meaning? ~What is a stopwatch? How does it relate in meaning to stop? ~Look at the <igh> trigraph in <stoplight> that is representing the phoneme /aɪ/. What other words can we think of that have the same <igh> trigraph? ~Now notice the <tch> trigraph in <stopwatch>. I wonder about that <tch>. I can think of beach, pinch, coach, and bench. The last grapheme in these words is <ch> and it represents the phoneme /tʃ/. Let’s start collecting two lists of words. One list will have words with a final <tch>. One list will have words with a final <ch>. Then we will see what we can notice about the two lists. There must be a reason that we use <tch> in the word ‘stopwatch’ and not <ch>. ~What is that spelling convention in which we sometimes double the final consonant of the base or stem? When do we double it? When don’t we? Just in the nick of time, here is the Affix Squad, ready to explain the doubling convention! The word ‘business’ has always been a sticky word for fifth graders to spell. But that is because they haven’t been taught to see it as anything but a complete word. They haven’t been taught to see it as < b-u-s – toggle the y to i – ness>. From the time our students are little, we teach them that spelling is about memorizing a letter sequence without understanding the order or structure in that sequence. Or we do them a bigger disservice and tell them to sound out words to help with spelling. 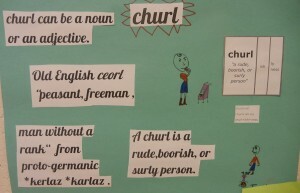 All that does is reinforce to the child the false notion that English spelling is ridiculous and unpredictable. BUT IT DOESN’T HAVE TO BE THAT WAY! This list provides the opportunity to discuss and solidify so many great consistencies of spelling! ~What does it mean to be busy? ~To begin with, <y> is sometimes a suffix. Is it a suffix in the base <busy>? ~Which words on this list are compound words? What is a compound word? ~Why do we use the <-es> suffix rather than the <-s> suffix to make <business> plural? ~If you want your reader to know there is more than one busybody, what spelling changes will you make to the word? ~What is the suffixing convention for bases that sometimes toggle the final <y> to an <i>? How do you know when to toggle and why? Here’s a video of my students explaining just that! 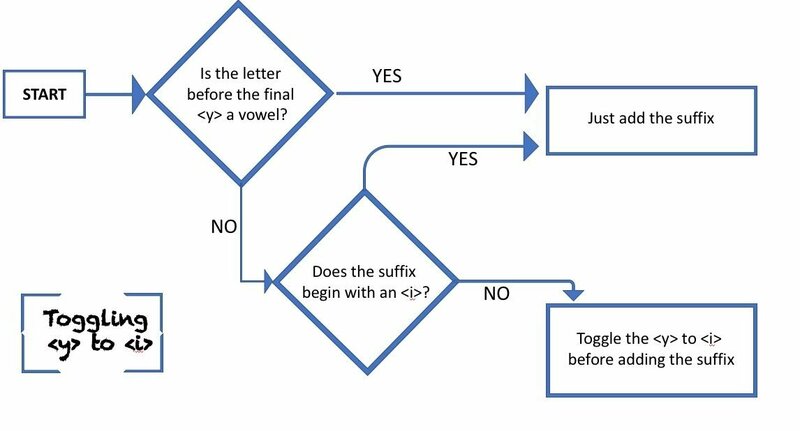 After talking about when to toggle a base or stem’s final <y> to an <i>, then there is the extremely important step of having the students read aloud the word sums. Here is an example of what I have my students do when they read word sums and need to explain their choices regarding this suffixing convention. Can you see how several spelling lists of related words in which the base has a final <y> will gradually help the student understand these conventions? And not just a surface understanding, but a deep understanding with (for many) an automatic application of these conventions? After focusing on several word families that need specific suffixing conventions, it is time to include a word family like <hap>, that has several family members that use more than one convention. This is an especially interesting family of words to discuss. Many students are surprised to find out that the word <happy> can be further analyzed. But that comes from rote memorization without talk of structure. They are even more surprised to find out its denotation is “chance, a person’s luck”. 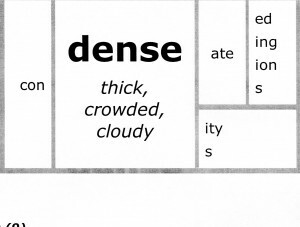 I love to look at this list with the students and let them point out the connection between each word and this base’s denotation. ~Which words in this family use more than one suffixing convention? ~When the suffix <-ness> is added to the stem <happy>, an adjective becomes a noun. What other nouns can we think of that have an <-ness> suffix? Are these concrete or abstract nouns? ~Which suffix could be used to modify a verb? ~Thinking of mishap, mismatch, miscount, and misinformation, what sense does the prefix <mis-> add to a word’s meaning? Can we think of other words with a <mis-> prefix that carries that same sense? 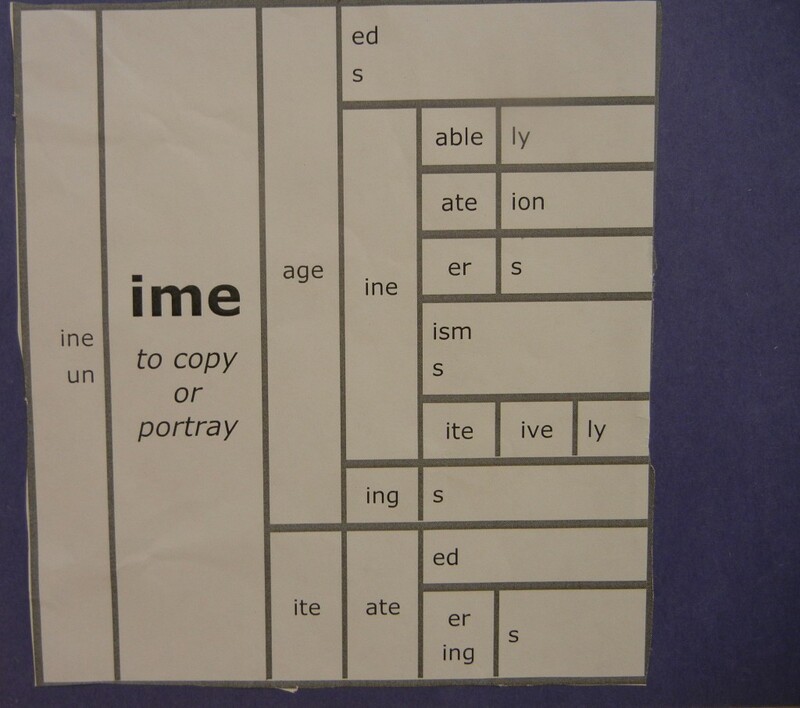 Structuring spelling tests in this way strengthens what we understand a word to mean. It helps students see the connectedness between words that share a base that they have not been taught to see before. This will help when encountering words from a family that perhaps they had not looked at during the focused list, but because of that list and the understanding they acquired, are recognizing it in a new word in their reading. A student will gain flexibility in their use of words in writing because they will have a deeper sense of a word’s meaning. Just as we have a deeper sense of who a person is when we’ve met their whole family, we can have a deeper sense of a word too. Structuring spelling tests in this way will require students to apply the suffixing conventions over and over and to make sense of when to use them. Currently, students memorize the spelling of many words without knowing which letters even ARE part of the base or affix. 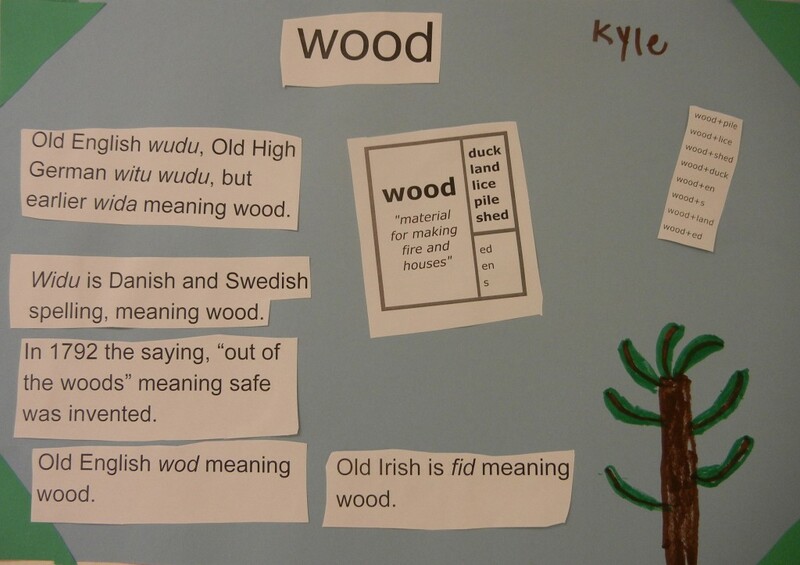 Learning that words have structure is such an eye opener for children. They begin to look at words differently. They begin inspecting words and thinking about what their structure might be and what meaning might be revealed in that structure. They notice the suffixes and recognize which suffixes cue that a word is a noun, adjective, adverb, or other. And finally, structuring spelling tests in this way will give students the opportunity to expect spelling to make sense. Imagine that! Spelling makes sense! Students will be empowered to ask questions. They will challenge their teachers with the questions they ask. How refreshing! The class will become a learning community instead of a teacher with the answers and students who are afraid of giving wrong ones. It will become a place where learning is celebrated! Of course, this is just a jumping off place. It’s an idea for spelling tests so the teacher can assess individual understanding. These will not feel like spelling tests to the students because they are writing word sums that they can make sense of. But I guarantee you that the word inquiries will pop up in every subject and at all hours. I was once stopped on the bridge downtown in the middle of summer by a former student who wondered about the structure of a word he noticed at his house. What could be better than that? I thought carefully for most of the summer about the best way to introduce the spelling truths (which I like to think of as the fabric of orthography) to my new fifth graders. Hmmmm. Where to begin? What to start with? What is the ground level understanding they will need in order to pursue independent inquiries? It was obvious to me that they needed to understand some linguistic terminology, the fact that words have structure, and the fact that it is more important to understand the meaning and sense of what a word brings to the context in which it is found than it is to be able to pronounce it. Beyond that, further orthographical discoveries will be more like delightful and savory surprises. Even with the determination of what I deemed an essential foundation, I continued to ponder what to start with. The students before me would not only be new to fifth grade, they would also be new to the idea of “spelling makes perfect sense”. There is very little they understand about “why” when it comes to spelling. They have spent their time sorting, grouping, using in sentences, copying and over-pronouncing words with the hope that the exposure alone will help the student memorize each word’s spelling. So, one word at a time, the students have been asked to memorize spellings. How deadening to the student who needs to understand in order to make a spelling stick! How unprofitable to the student who can easily memorize those spellings, but is never shown the relationships words have with one another. So it isn’t just that the students are coming to me with a lack of understanding, they are also coming to me with little interest and low expectations that studying spelling can be anything but dry and dull. I thought some more. What will ignite their eagerness to know more? As I thought, I thought back to what ignited my own eagerness only three and a half years ago. What were those word examples that made me believe that I was indeed staring spelling truths straight in the face? Which matrices made convincing evidence obvious to me when I wasn’t even looking for it? Which orthographic nuggets made me lift my eyebrows and smile? Here’s what I did. On day one I wrote three words on the board: <to> <too> <two>. The students were aware that these were homophones. They understood that homophones share a pronunciation but not a spelling. Next I asked them to give me a definition of each word. They found it easier to use the words in sentences than to define them, especially with <to>. At this point, I brought up the idea that words can be categorized as either function words or content words. Function words tend to have less letters than their homophone partners, and are less easy to define in isolation. We identified <to> as a function word that is commonly used as a preposition. Then we talked about the spelling of these three words, and noticed that the first had one <o>, the second had two <o>’s and that the third couldn’t have three <o>’s. That is something we don’t see in a complete English word. So why is there a <w>? A third <o> couldn’t be used so the next best thing was a <w>? Hmmmm. Interesting. Perhaps there is an explanation to be found if we look at words related to <two>? I asked if anyone could think of a word that had a <tw> letter combination and also had something to do with the number two. Almost immediately someone thought of <twelve>. As that person was explaining the connection to the number two, other hands shot up. We ended up with a list on the board that included twenty, twice, twilight, twist, twin and between. Suddenly the spelling of the number two was less weird, less random. The <w> was there to mark a connection between the number two and other words with <tw> that also have something to do with two. On day two I began by showing a video my students made a few years ago. It’s called “Can You Prove It?” It’s a game show in which the two contestants are given words, and they have to identify the suffix. As they name the suffix, they also provide evidence to prove that their choice makes sense. At its end we discussed things like free and bound bases, prefixes and suffixes, and the terms ‘word sums’ and ‘word structure’. We also addressed the appearance of a single non-syllabic <e> in the word sum <mote> + <ion>, but not in its final form <motion>. 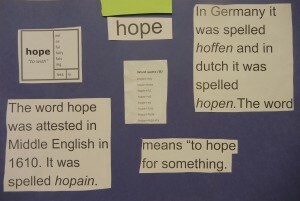 Every student in the room knew that there would be a final non-syllabic <e> in the word <hope> and that the <e> was not in the word <hoping>, but because they do not know WHY it is in one and not the other, they don’t expect that same convention to happen in other words! 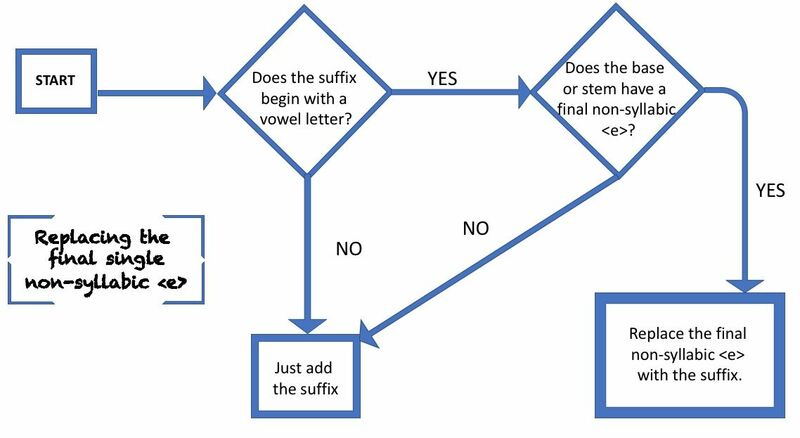 I patiently listened as the students pronounced the suffixes as if they were words, knowing that on day three I needed to show them why morphemes need to be spelled out and not pronounced. On day three I wrote the word <sign> on the board and asked if it was free or bound. It was identified as free because it could be used without adding any affixes. Then I went to my desk and pulled Etymonline up on the SmartBoard. We looked together at the entry for <sign>. I talked a bit about the “early 13c.” that began the entry. I explained that that is when the word was first attested. Doug Harper, the author of Etymonline, looks at written documents to find the earliest date he can in which the word in question was in use. If he finds a written document with the word, he notes the date and looks at written documents from before that date. He stops when he cannot find the word in any earlier written documents that he has access to. Does that mean the word couldn’t have existed before that? No. It means we do not have evidence of it existing before that. 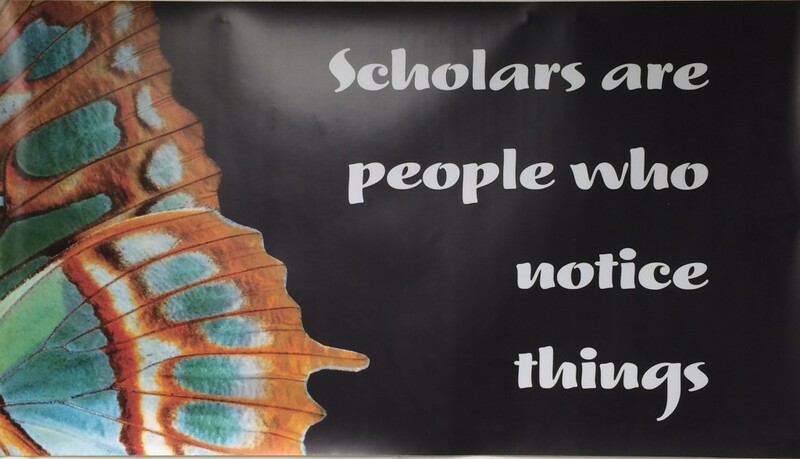 I wanted to make sure that my students know that scholars rely on evidence, and if we are going to be scholars, we will need to rely on it too. We went on to read the rest of the entry and found out how recent the term sign language really is (1847). Next I walked over to the white board again and began a matrix for the free base <sign>. After having read the full entry for <sign> at Etymonline, it was decided that “to mark” would be a denotation we could use. The students brainstormed words that belonged to this family, and I filled in the matrix. It didn’t take long before someone suggested the word <design>. “Say that again,” I asked. “Are you pronouncing the base in <design> the same way you would if the <de> prefix were not there?” The students noticed that the <s> was pronounced as /z/ in <design> and /s/ in <sign>. 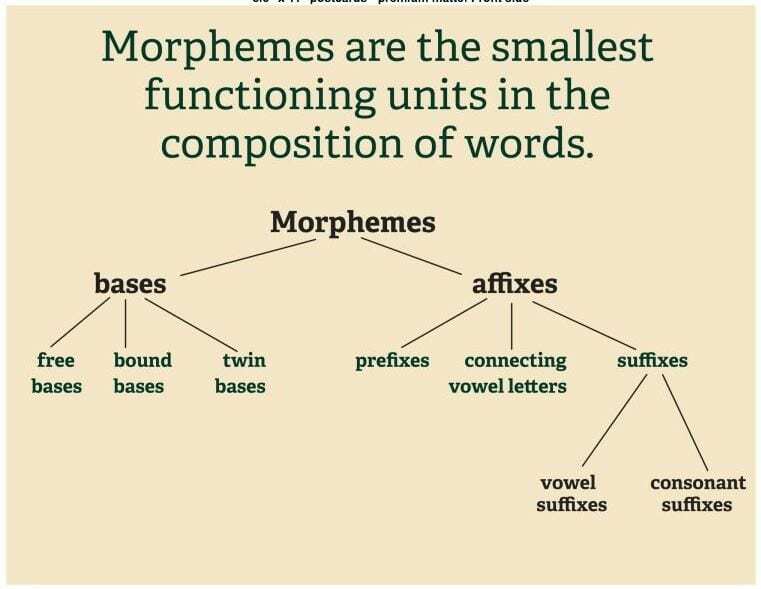 This is a reason to spell out our morphemes instead of pronouncing them as if they are words. Until a word is complete, we don’t know how to pronounce it. After students suggested <signer>, <designs>, and <signing> there was a pause. “Can you think of any others?” I asked. A hand went up and a boy quietly and uncertainly asked if <signature> might be one. “Well, does a signature have anything to do with making a mark?”, I asked. While the students were agreeing that it did, someone else blurted out excitedly, “And this word is evidence for having the <g> in the base!” That was like music to my ears! More quickly than I expected, they are connecting dots! The final word added to our matrix was <signal>, to which someone blurted, “…more evidence for why there’s a <g>!” But it was also evidence to support the practice of spelling out morphemes until a word is complete and ready to be pronounced. I told them that the Latin word dies (day) has the bound base <di> that we see in our modern word <diary>. That made sense since a diary is where we do daily writing. They knew that solis had to do with the sun because they thought of <solar>. They knew that lunae had to do with the moon because they thought of <lunar>. 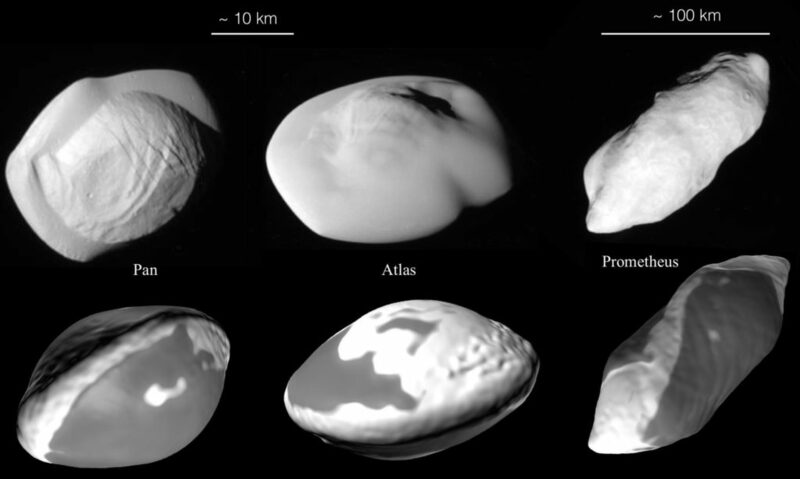 As for the rest of the days, they named every planet except Jupiter (lovi). At this point, we could definitely see that the names were becoming familiar! We especially enjoyed learning that <Friday> and <friend> share a base, and therefore a denotation! Friday was named for Venus which was associated with the characteristics of love and affection. Isn’t a friend someone for whom you have a level of love and affection? As we were finishing up our discussion of how the days of the week were named, one boy turned to the student next to him, put his hands to his head, and made a gesture as if his mind had just been blown! It was just the reaction I had hoped for! The eagerness is settling in. I can feel it. On day five, I shared a video of two 6 year old boys who were investigating <carnivore> in Jim and Lyn Anderson’s classroom. When it was finished, I asked if anyone thought that <carnivore> was a pretty big word for first graders. Lots of students raised their hands. Then I asked if anyone in the class had ever been fascinated with dinosaurs at the same age. Only a few hands went up, but the children those hands belonged to were ready to relive that enthusiasm and tell about their favorites! I was making the point that 6 year old children are not intimidated by large words. It is the adults and the writing programs they use who decide what length of word is appropriate at what age. How confining and insulting! Secondly, look at the comfort these boys have in using the online resource Etymonline. They do not stop and embarrassingly try to pronounce a word in Late Latin. Instead they spell it and learn from it what they need to know – how its spelling compares to the word they are investigating. And they aren’t just blindly copying things down in their notebook. They are talking about what they are discovering and can easily explain their understanding without having to read it out of their notebook. I wrote <carnivore> and <herbivore> on the board. We reviewed that the boys had said the base of <carnivore> was <carn> and meant “meat”. I reminded them that the teacher had mentioned a second base which was <vore> and that the boys had defined it as “eat or only eat”. I wrote a word sum: <carn> + <i> + <vore>. I didn’t say anything about the <i> just yet. Then we looked at <herbivore>. I began a word sum, bracketing the known base <vore>. Someone spotted the familiar base <herb> and could even tell me it was a free base. I finished the word sum: <herb> + <i> + <vore>. I wondered if anyone recognized what these two word sums had in common. That is when we turned our attention to the <i> in both words. I explained that it is a connecting vowel, and that because it is an <i>, we know that it is from Latin. Someone asked if it is like a conjunction. In a way it is. It is an affix that connects two morphemes in a word. Then I shared the word that first convinced me that a connecting vowel was a real thing: <speedometer>. This is a compound word with two free bases. It is obvious that the <o> is not part of either base, but is there to connect the two. And because the connecting vowel is an <o>, I know this word is from Greek. We talked about the fact that these are both compound words because there are two bases in each. I pointed out that they have the same structure: a base + a connecting vowel + a base. All words have a structure. I demonstrated this by bringing back the examples we saw in our <hope> matrix and our <sign> matrix. So that is how the first week went. I feel good about the choices I made in regards to what I shared and what was introduced. I’ve seen the eyebrows go up and the smiles cross their lips. At the end of day five, a girl told the class that every night her mom asks her what she learned that day. She hasn’t always had something to tell her mom. But this year it’s different. Every day this week she taught her mom some orthography! Another school year has come to an end. The faces I have grown accustomed to will now grace someone else’s classroom. I will be left with remembrances of the many times we learned together, stumbled together, and laughed together. As we take some time to think of the ways this year has moved us all forward by increasing what we understand about our world, the topic of orthography comes to mind. Back in September a few students lit up right away once we began talking about words and structure and reasons for spelling that had nothing to do with phonics. The rest were quite sure that it seemed like a lot of work. 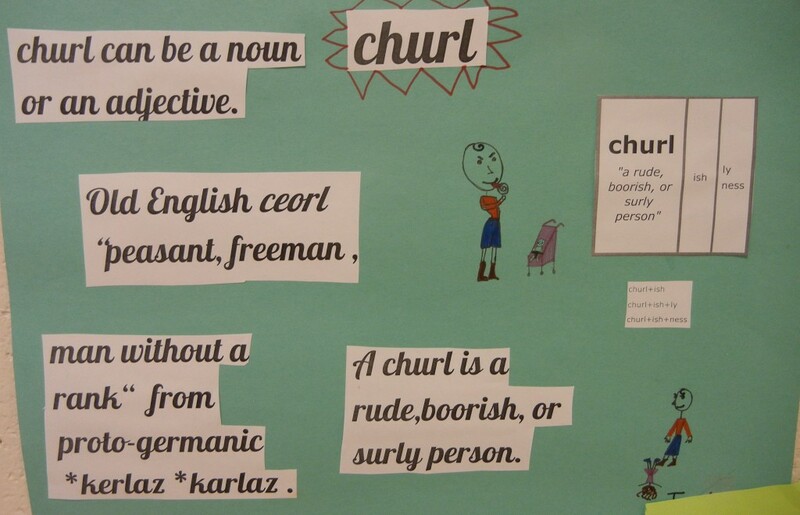 The students were used to having spelling and pronunciation be the most important thing to know about a word. I flip flopped that thinking and asked them to consider the sense and meaning of the word before thinking about either of those. It was really one of the toughest challenges I faced this year. You see, when spelling and pronunciation are considered more important than a word’s meaning, then the word is an empty thing. Learning its spelling becomes a memory task, much like memorizing digits of Pi. The digits of Pi are random and there is no pattern to rely on. The students had spent years memorizing words that were empty for them. They did not see how knowing the meaning of a word would be helpful to understanding its spelling. Long into the school year I would catch students who were trying to figure out the word sum for a word that they could not define. Slowly but surely progress was made. The students became more and more familiar with common prefixes and suffixes. They began to understand that affixes affect the overall sense and meaning of the base. 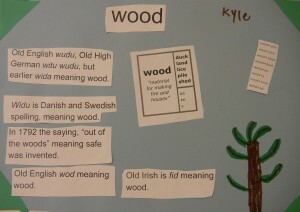 They began to see words as having a structure that brings sense to the word’s spelling. When the structure begins to be understood, then spelling doesn’t need to be memorized. The student will be able to rely on their knowledge of that underlying word structure and suffixing conventions to spell words. Today I asked students to think back on the orthography work we have done this year. I asked them whether or not there is a benefit to studying it. The following video says it all. My students overwhelming wish other grade levels could experience it and learn some of what they have. The following video is a conglomeration of silly moments from our year together. The students enjoyed making videos this year and were so patient with me when I was filming. I put this one together just for them. Come Right In, Have a Seat, and Let’s Talk! I love parent/teacher conferences. There. I’ve said it. Yes, there is a lot of preparation on my part. Typically I spend 11 hours at school each day leading up to the big night . Yes, it is one very long work day (14 hours). But, the fact remains that I still love them. And I look forward to them. First off, I get to look into the faces of each child’s parents/guardians and let them know that I see in their child the sweet wonderful brilliance they were hoping I would see. 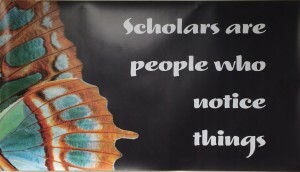 Years ago, a student of mine wrote out a Marva Collins quote on a sheet of construction paper. “There is a brilliant child locked inside every student.” I have kept it up on the wall in the front of the room ever since. 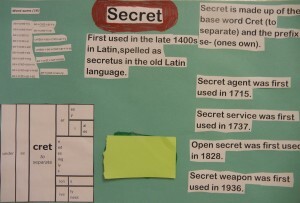 I love the fact that it is on construction paper, and I love the fact that it is in a child’s handwriting. For many of the children who have sat in chairs before me, that lock has been fairly easy to pick. But for some, their behaviors have presented quite a smoke screen, obscuring that brilliance! Every child needs to know I see through to that brilliance. Parents need to know it too. Secondly, I get to explain what the students are learning about words! I know it’s not the only subject I teach, but in my mind it is the one that illuminates all others. I explain that in the first trimester, my main focus is to show the students that words have structure. By that I mean that words are made up of bases and affixes. To further explain, I share my own childhood experience of learning that a root word (commonly misused name – correct name is base) could have a prefix and/or a suffix. I compare that with my recent discovery (since I began learning about Structured Word Inquiry), that in fact a word can have more than one suffix. Wham! The spelling of so many words makes so much more sense to me! The seemingly complicated word <antidisestablishmentarianism> suddenly becomes a less complicated word with three prefixes, six suffixes and a rather short two letter base. If I’ve peaked your interest, the base is <st> from the Latin root stare meaning to stand. The three prefixes <anti->, <dis->, and <e->(a clip of <ex->) help us see the meaning of this word as to stand against, away from or out of the norm. And once a person is familiar with all of the affixes used, spelling this word will be no problem. The suffixes <-able>, <-ish>, <-ment>, <-ar>, <-ian>, and <-ism> can individually be found in a lot of familiar words. The final suffix in the word tells us that this word is a noun. I love talking about this word because it illustrates beautifully the reason for learning morphemes (the smallest unit in a word that still holds meaning) rather than the endless hours students spend learning syllables (no meaning and a no letter consistency from word to word) to help with spelling. We also had a hallway of word work to share! In the last few weeks, I have had the students each choose a word to research. In doing so, they have become familiar with some great resources. The first thing they discovered is that dictionaries are not all alike. Finding a dictionary that you like, trust and can understand is important. This project also gave the students great practice at reading the entries at Etymonline and understanding that words weren’t all created at the same moment nor in the same language. Some really enjoyed noticing the journey their word experienced on its way to becoming a Present Day English word. Some found fun facts about when their word began acquiring alternative meanings. Everyone enjoyed making word sums and creating fascinating looking matrices. Once the word sums were typed in, there was this anticipation and glow of pride as the ‘update’ button was pressed and the matrix was revealed. Absolutely everyone found out that words have stories! Onward to our next science topic … the Earth’s Systems. The first step was to look in a standard dictionary to find a definition. Once each group had an understanding of the word, it was time to look at the structure of the word. Students came up with one or more hypotheses about their word. For example, one group thought that the structure of geosphere might be either <geo> + <sphere>, <geo> + <sph> + <ere>, or <geos> + <phe> + <re>. It was time to research the word to see if we could find the root of the word. That would likely help us identify the base element. The students recognized that <sphere> is a familiar word and doesn’t need an affix to be a word. It is therefore a free base. Now they were ready to use Word Searcher. Each group went to work finding relatives of each bound base’s family. This search often included quick trips to Etymonline or other dictionaries to make sure that the words collected did indeed share meaning with the base. Once their list of relatives was compiled in their notebooks, the students began writing out word sums and creating a matrix. Having a list of words to investigate that were so structurally similar was interesting. Once we talked about the free base <sphere> that was common to all the words on the list, we had the opportunity to practice using online tools like etymonline and word searcher to find out about the other base in each word. At first it was hard to see these words as compound words because the first base was a bound base and not as recognizable as a free base would be. We had opportunity to practice spelling out words using word sums. The students are so used to spelling words letter by letter, that they keep forgetting to group the letters into morphemes as they spell. This will take some practice. I know! It was a habit that I personally had to break not so long ago. But I also know it will be worth it in the long run. Students created their own matrices. This was challenging because the students don’t recognize many suffixes besides <s>, <es>, <ed>, and <ing> yet. They are definitely becoming comfortable with the idea that a word can have several suffixes. With so many students presenting, we were able to notice an <ant> and <ic> suffix being used in several of the matrices. I was also able to begin demonstrating how to collect evidence to prove whether a letter combination was a suffix or not. There are still several groups ready to present their word investigation. This will give the students more opportunity to talk about spelling and words in a way that is foreign to them. I know that these students have never been as mentally engaged with words as they will be this year. I smile when I think of how much they will learn! Wow! It’s been a very busy eight days since I first handed out the scripts for our Photosynthesis Follies. Yesterday and today we performed for twelve different audiences! They included almost all of the students in our building and lots of parents and family members. Over and over again we explained the process of photosynthesis to all those who came to listen. Back in our classroom, in the chunks of time between those performances, the students took a closer look at the words photosynthesis and transpiration. They began with basic definitions and then created word sum hypotheses. Watching the videos it is obvious there is more to discover. In the first video, Jacob’s research took him in many directions! He was one of three who rather excitedly asked if he could work on this at home too! This was the first time the students were off on their own to explore. The lists of words he found to prove the <ic> suffix and the <photo> prefix are impressive. He had come across many examples of <syn> as a prefix as well, but didn’t have them all written down. In this video Zoe is also looking at photosynthesis. She has found evidence to support her word sum hypothesis <photo> + <syn> + <thesis>. Next up is understanding what each morpheme means and how they help us uncover a deeper sense of what photosynthesis is. In the next video this team of girls came up with some interesting ideas. It is so second nature for the students to begin with the notion of sounds in words. I found it interesting that this was one of the few groups that recognized that there is an <e> that was dropped when the suffix <ion> was added. More investigating will uncover the other morphemes in this word. The boys in the second half of this clip made a great discovery minutes after my camera battery gave up. They had found the word <expire> and were comparing it to <transpire>. I can’t wait to see what comes of this! What an exciting time. The students are ready for the challenge of figuring things out on their own. This is going to be a wonderful year! Evaporation; Condensation – Don’t Get All Misty-Eyed! I learned much! The vast majority of the students spelled both words correctly, but the vast majority did not write an accurate word sum for that spelling. For some of my students the tendency is to divide words by syllables rather than bases and affixes. This makes for some random word sums as their hypothesis! Even though they have knowledge about certain prefixes and suffixes, they aren’t applying that yet on an automatic basis. I’m confident that as the investigations continue, and they talk about why they are making the choices they are making, that this will all come together. Today we split into four groups. Two groups investigated <evaporation> ,and two groups investigated <condensation>. 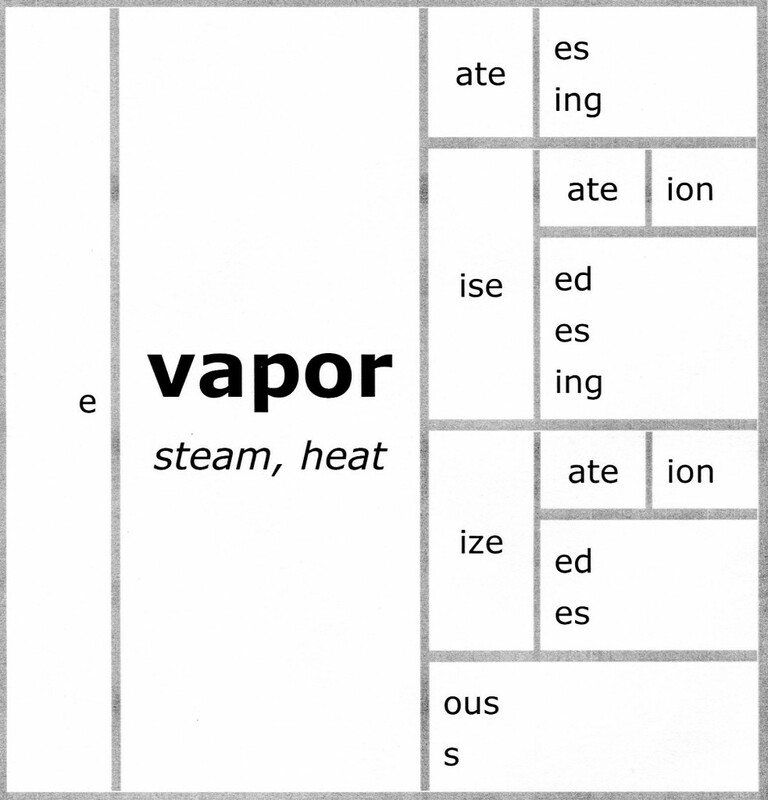 Rather quickly, both groups looking at <evaporation> found the base element to be <vapor>. We all found out that <e> is from the prefix <ex> which means out. That really helped with picturing evaporation! Students used their hands to describe the vapor moving in an outwards direction. The suffixes <ise> and <ize> in the matrix for the base <vapor> reminded us of the books we read by Roald Dahl earlier in the year. As we read we collected spellings that were slightly different than what we were used to. We remembered the word <realise>, which we knew was a British English spelling rather than what we are used to – American English spelling. The two groups investigating the word <condensation> approached it quite differently. The first group began with a pretty accurate word sum hypothesis. Then they looked up <condensation> and <dense> to find out more. With prompting they added the meaning of the prefix to their understanding of the base. The second group was trying all sorts of random letter combinations as part of their word sum hypotheses. At first it didn’t seem as if they had a plan, meaning a logical order for how to proceed with their investigation. When I asked if they had looked on their list of proven prefixes to see if anything matched what they were seeing in the word, things began to click. As we continue our study of the Civil Rights Movement, interesting words keep popping up. So far we have looked at prejudice, segregation, and integration. During the research into those words, the words ‘apartheid’ and ‘discrimination’ surfaced. Intrigued, we began with the word ‘apartheid’. We read some information and recognized that there were some parallels to be drawn between the situation in South Africa from the late 1940’s to the 1990’s and the situation in the U.S. prior to the 1960’s. Then we wondered how the words ‘apartheid’ and ‘discrimination’ fit in with the other words (as far as meaning) that we have collected on the topic. It was time to investigate. Two groups of students investigated the word ‘apartheid’. Here is what they found. Three groups of students investigated the word ‘discrimination’. It was fascinating to listen to the hypotheses the students started with, and then the reasoning they used to alter them. 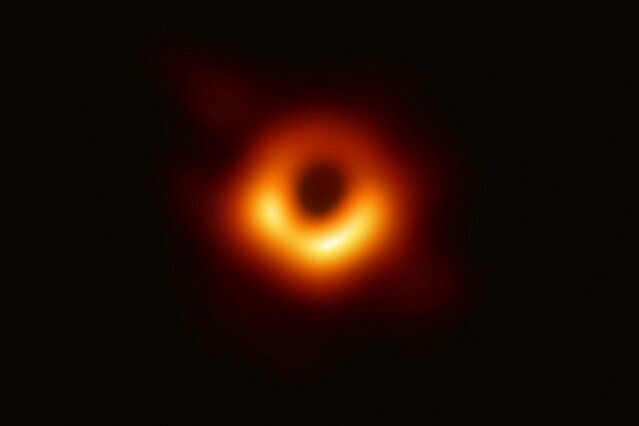 It’s been pointed out to me by other orthographers that what I see happening while the students investigate and recap that investigation is the really worthwhile part of all this. I believe it. 1) One of the groups found that ‘dis’ is a prefix and means away from. Can that be proven or disproven? 2) We know that ‘in’ is a prefix. Is it also a suffix? Check on WordSearcher for other words that end with ‘in’. 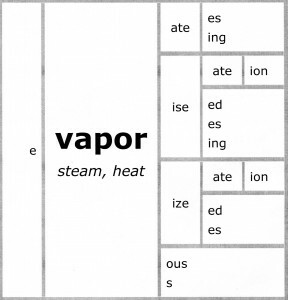 3) One group believes ‘ate’ and ‘ion’ are both suffixes in this word. Another group believes ‘at’ and ‘ion’ are the suffixes. How can we prove/disprove either of these?